In the UK we are privileged to have a wealth of historical buildings that have stood the test of time; surely a testimonial to the skill of master craftsmen of the past. Today we have taken over the reins of our predecessors to restore, repair; or in this case, reconstruct a hidden historical gem that could have been lost in time. We were instructed by our clients, owners of this fine 14th century listed building, to carry out a thorough survey of work that was required. When we got to the roof we were quite certain that the chimney stack would need some attention. Home fires were a smoky affair until bricks came into use on domestic dwellings in the late medieval times. Previous to this, smoke from the fire would fill the house, escaping either through a hole in the roof or a hole in the wall made for that purpose. Most enclosed houses remained smoke filled buildings. Even once in wide use; chimneys remained notoriously inefficient and often dangerous. Cheaper chimneys constructed of waddle and daub, a woven wooden structure covered by mud, clay, straw and dung remained susceptible to fire. In the early seventeenth century English courts began demanding “dangerous” chimneys be reconstructed using brick and mortar and requiring that the top of the chimney be at least four and a half feet above the roof of the house. In this case the stack had been rendered in modern render; not sympathetic to this era and underneath the bricks were perished, making the whole stack in danger of collapse. Along side, English heritage we recreated this authentic Chimney stack, specifically designed to historically match the original design of the house. 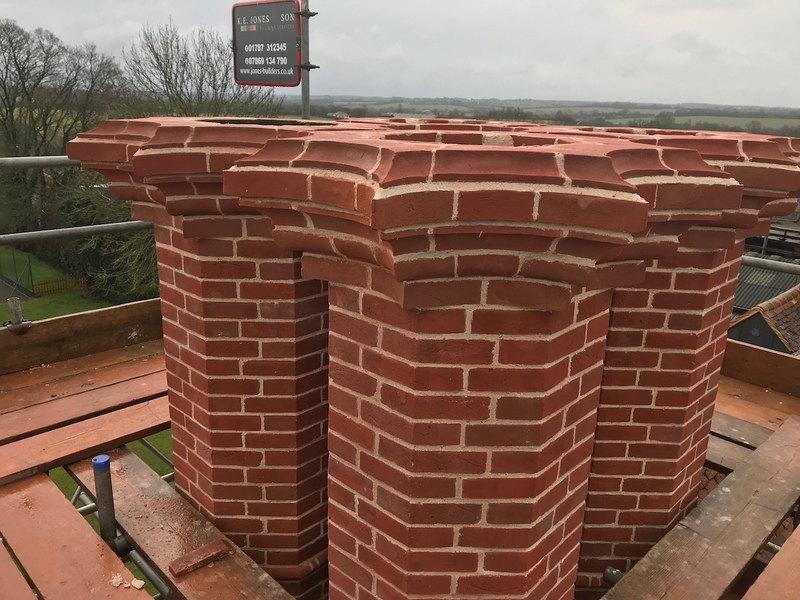 The bricks were individually hand made by Bulmer bricks http://www.bulmerbrickandtile.co.uk and we carefully rebuilt the chimney stack using lime mortar. We were very pleased with the outcome and what a difference it has made to the appearance of the property; we like to think those craftsmen of yesteryear would be happy with our work.